3. Using your knife and cutting board, cut the mushrooms in big cubes, and sauté it in butter. Add some of the shallots, salt & pepper. 4. Boil your asparagus and the carrots in salted water and cook to your liking. Please sauté it on butter as season with salt and pepper. 5. Reheat your ratatouille in a pan. 6 . After cleaning the spinach properly, sauté it on a pan with butter. Add the remaining shallots and garlic, and season with salt and pepper. 7. 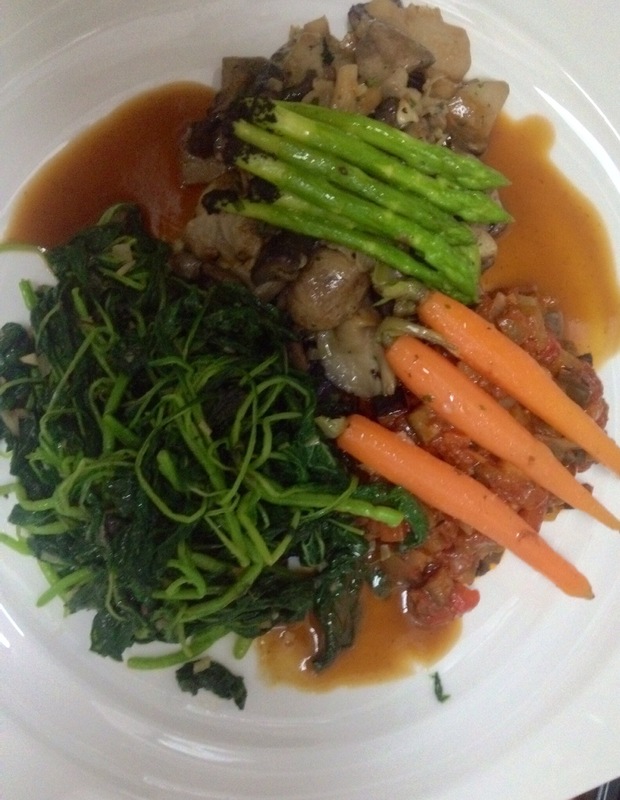 Dress all your ingredients on your plate as you prefer it and add the beef jus around. This dish is very healthy and low in calories. It is a nice assorted vegetable dish which can be a main course on its own, or an addition to a main course of meat or fish. The dish is tasty, filling and full of nutrients. You can eat as much of these quality ingredients as you want and you will not feel like snacking later. Previous PostBROCCOLI & CAULIFLOWER “RICE”Next PostWhat is the Primed Lifestyle?